Page needed to probe where Palestinian money comes from and where it goes. One often-cited key to peace between Israel and the Palestinians is economic development. To that end, there seems to be broad agreement about the importance of extending development aid to help the Palestinians build the physical and social infrastructure that will enable the emergence of a sustainable, prosperous society. But few have seriously questioned how much money is sent and how it is used. Such assistance will only promote peace if it is spent to foster tolerance and coexistence. If it is used to strengthen intransigence it does more harm than good - and the more aid that comes in, the worse the outcome. This is exactly what has been transpiring over the past few decades. Large amounts of foreign aid to the Palestinians are spent to support terrorists and deepen hostility. For years the most senior figures in the Palestinian Authority have supported, condoned and glorified terror. "Every drop of blood that has been spilled in Jerusalem," President Mahmoud Abbas said last September on Palestinian television, "is holy blood as long as it was for Allah." Countless Palestinian officials and state-run television have repeatedly hailed the murder of Jews. This support for terrorism doesn't end with hate speech. The Palestinian regime in Ramallah pays monthly stipends of between $400 and $3,500 to terrorists and their families, the latter of which is more than five times the average monthly salary of a Palestinian worker. According to data from its budgetary reports, compiled in June 2014 by Israel's Ministry of Foreign Affairs, the PA's annual budget for supporting Palestinian terrorists was then roughly $75 million. That amounted to some 16% of the foreign donations the PA received annually. Overall in 2012 foreign aid made up about a quarter of the PA's $3.1 billion budget. More recent figures are inaccessible since the Palestinian Authority is no longer transparent about the stipend transfers. Embarrassed by public revelations of the misuse of the foreign aid, in August 2014 the Palestinian Authority passed the task of paying stipends to terrorists and their families to a fund managed by the Palestine Liberation Organization, also led by Mr. Abbas. Lest there be any doubt as to the purely cosmetic nature of the change, Palestinian Prime Minister Rami Hamdallah made assurances as recently as September 2015 that the PA will provide the "necessary assistance" to ensure these terror stipends. This procedural ruse apparently calmed the consciences of donor governments that continue to transfer aid. It is difficult to think of another case in which such a forgiving attitude would be taken regarding foreign aid to an entity that sponsors terror. This situation is particularly disturbing given the disproportionate share of development assistance the Palestinians receive, which comes at the expense of needy populations elsewhere. According to a report last year by Global Humanitarian Assistance, in 2013 the Palestinians received $793 million in international aid, second only to Syria. This amounts to $176 for each Palestinian, by far the highest per capita assistance in the world. Syria, where more than 250,000 people have been killed and 6.5 million refugees displaced since 2011, received only $106 per capita. A closer look at the remaining eight countries in the top 10 - Sudan, South Sudan, Jordan, Lebanon, Somalia, Ethiopia, Afghanistan and the Democratic Republic of Congo - is even more alarming. CIA Factbook data show that these countries have a combined population of 284 million and an average per capita GDP of $2,376. Yet they received an average of $15.30 per capita in development assistance in 2013. The Palestinians, by comparison, with a population of 4.5 million, have a per capita GDP of $4,900. In other words, though the Palestinians are more than twice as wealthy on average than these eight countries, they receive more than 11 times as much foreign aid per person. The Democratic Republic of Congo is a case in point: Its 79 million people have a per capita GDP of $700, yet they receive only $5.70 in aid per person. Between 1993 (when the Oslo Process began) and 2013, the Palestinians received $21.7 billion in development assistance, according to the World Bank. The Palestinian leadership has had ample opportunity to use these funds for economic and social development. Tragically, as seen in Hamas-run Gaza, it prefers to use the funds on its terrorist infrastructure and weaponry, such as cross-border attack tunnels and the thousands of missiles that have rained down in recent years on Israel. In Judea and Samaria, the "West Bank," the situation is equally disturbing. Aside from funding terrorists and investing in hate speech, the PA stubbornly refuses to remove hundreds of thousands of Palestinians from "refugee" rosters, deliberately keeping them in a state of dependence and underdevelopment for no purpose other than to stoke animosity toward Israel. It is difficult to come away from these facts without realizing the deep connection between the huge amounts of foreign aid being spent, the bizarre international tolerance for patently unacceptable conduct by the Palestinians and the lack of progress toward peace on the ground. Donors to the Palestinians who support peace would do well to rethink the way they extend assistance. Money should go to economic and civic empowerment, not to perpetuate a false sense of victimhood and unconditional entitlement. It should foster values of tolerance and nonviolence, not the glorification and financing of terrorism. Ms. Hotovely is the deputy foreign minister of Israel. Over the last few years we have alerted our readers to the fact that most of the international 'Christian' humanitarian aid organisations are extremely anti Israel, and therefore they are directly working against the plans and purposes of God, their unBiblical behaviour hindering, not hastening the return of Yeshua and the restoration of the Kingdom of God in the Earth. World Vision and Tear Fund are two such groups who are very anti Israel. Now the truth has been exposed that WorldÂ Vision is not only anti Israel, but that they have been giving the money that well meaning Christians have donated to Hamas to buy weapons to carry out terror attacks against Israeli Jews. This news is now being published on many media websites. Australia & Germany have immediately ceased all funding of World Vision. The Shin Bet (Israel'sÂ Security Agency) recently announced the arrest of Mohammed El-Halabi, 38, from the Gaza Strip. El-Halabi is director of the Gaza branch World Vision. He was detained on suspicion of serious security offenses carried out for Hamas. During the investigation, El-Halabi revealed that he has been a Hamas member since his youth and had undergone organizational and military training some 15 years ago. In 2005, Hamas dispatched El-Halabi to infiltrate World Vision. He said Hamas believed that he had a good chance of infiltrating the humanitarian aid organization because his father works for the UN and he himself had worked for the United Nations Development Program. El-Halabi acknowledged that his father, Halil El-Halabi, who has served as head of UNWRA's educational institutions in the Gaza Strip for years, is a member of Hamas and uses his position as a UN employee to help the terrorist organization. 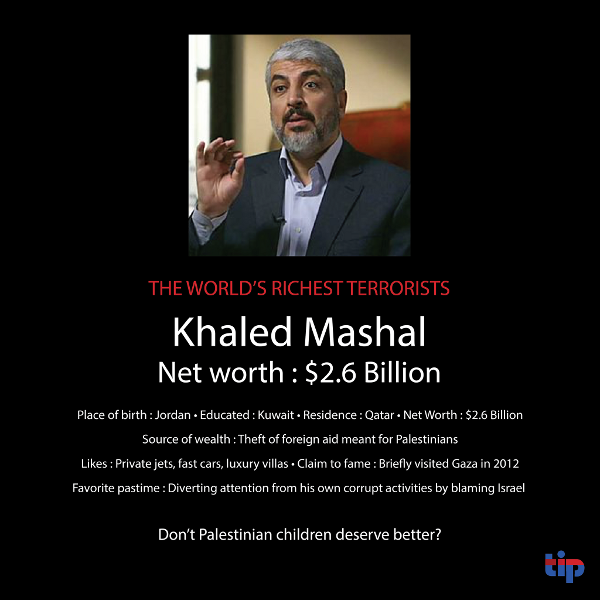 Shortly after being employed by World Vision, El-Halabi began to use his position to benefit the Islamist terrorist organization, primarily by diverting funds meant as aid to strengthen the HamasÂ terrorist arm. El-Halabi was appointed director of the Gaza branch where he controlled the budget, equipment and aid packages which amounted to tens of millions of dollars. The alleged funneling of tens of millions of World Vision charity dollars to Hamas for terror purposes is only a tiny example of the massive abuse of aid cash intended for Gaza residents that instead is used to fund Hamas, a senior Knesset member who used to head the Shin Bet intelligence agency said Monday. The funneling of international aid to finance terror by Hamas and other violent Islamist groups in the Gaza Strip is widespread and the world is hideously naive as regards the scope of the problem. Australia and Germany have suspended funding to the World Vision. Australia's Department of Foreign Affairs and Trade (DFAT) called the allegations deeply troubling,Â and said that it was urgently seeking more information from World Vision. We are suspending the provision of further funding to World Vision for programs in the Palestinian Territories until a rigorous investigation is complete.Â Any diversion of the generous support of the Australian and international community for military or terrorist purposes by Hamas is to be deplored. At the end of the week it was announced that a worker for Save the Children organisation has also been working for Hamas. Incitement to hate and terror, including payment of salaries to terrorists, imprisoned terrorists and families of dead terrorists. Itamar Marcus, of Palestinian Media Watch, stressed that Congress, the EU Parliament, and even the Israeli government were unaware of just how the PA uses the aid money it receives. "The Palestinian Authority pays all terrorists in Israeli prisons a salary of up to $12,000 a month, which is more than 4 times the average salary in the PA."
The United Kingdom announced that it was placing new restrictions on transfer of aid the Palestinian Authority in order to ensure it does not reach terrorists or their families. Aid to the PA will continue, but "certain key changes will be made to ensure this funding delivers the best value for money and maximum impact for Palestinians," said a government statement. The first change announced in the statement was that support will now focus solely on vital health and education services, in order to meet the immediate needs of the Palestinian people and maximize value for money. Funding will only go towards the salaries of health and education public servants on a vetted list." The UK will help pay the salaries of up to 30,000 teachers, doctors, nurses, midwives and other essential health and education public servants on a vetted list, said the statement, allowing Â some 25,000 young Palestinians to get an education, providing up to 3,700 immunizations for children, and around 185,000 medical consultations annually. Financial aid will now be channeled directly through the EU's PEGASE mechanism (Palestinian-European Socio-Economic Management Assistance Mechanism), said the statement. The second change is that UK funds will no longer be used to support the salaries of non-working Palestinian Authority public servants in Gaza. More and more countries are turning their backs on the PA and cutting funding over their support of terrorism and incitement. The Palestinian Authority's (PA) actions of supporting and promoting terrorism against Israel have finally caught up with it, and the US has completely cut its direct support to the PA in 2016 over its belligerent conduct. PA Prime Minister Rami Hamdallah stated earlier this month that the US has completely stopped funding the PA's general budget. "2016 is about to end, no shekel or agora, or dinar or dollar has been paid," he said in an interview with the Voice of Palestine Radio, according to Palestinian Media Watch (PMW). Hamdallah's remark corroborates a statement made by US Assistant Secretary of State Anne Patterson in April. At a hearing with the Foreign Affairs Committee of the US Congress following the release of PMW's report, titled "The PA's Billion Dollar Fraud," Patterson was challenged by committee chairman Ed Royce as to why the US was funding the PA, given documentation that the PA was still paying salaries to terrorist prisoners. Many other countries have likewise cut off funding to the PA, totaling a loss of 62% â€“ 70%, according to PA government ministers. For years, there have been calls to cut foreign funding to the PA over its support of terrorism. American legislators have been setting restrictions and conditions to the PA funding, due to its activities and incitement that undermine peace. As a result, the PA has not been eligible for funding under American law for many years. Yet the PA was able to receive funding because US law also enabled US presidents to waive the funding restrictions of the law if it was in American national interest. For example, President Barack Obama announced such a waiver in 2013, saying it was "important to the national security interests of the United States." However, Congress did not support the routine presidential waivers given the continued PA incitement to hatred and terror. To curb this, Congress eventually made it harder for the president to use the waiver, requiring him to show that the PA is "acting to counter incitement." During the terror wave in 2015-2016, the PA leadership actively supported and justified the murder of Israelis. The PA prohibits peace-building activities between Palestinians and Israelis and vilifies them as "normalization." It should be stressed that American law prohibits US money from being "deposited in a PA account," which is what Hamdallah complained about. However, the US has been covering some PA debts, as stated by Patterson. Numerous parliamentarians in other countries, including Norway, Britain, Denmark, Germany, the Netherlands, and Sweden, have discussed cutting off funding to the PA over the regime's incitement to hate and terror, including payment of salaries to terrorists. Britain publicly announced it was freezing 25,000,000 pounds â€“ a third of its funding to the PA. Many other countries have likewise quietly cut off substantial funding, according to the PA. 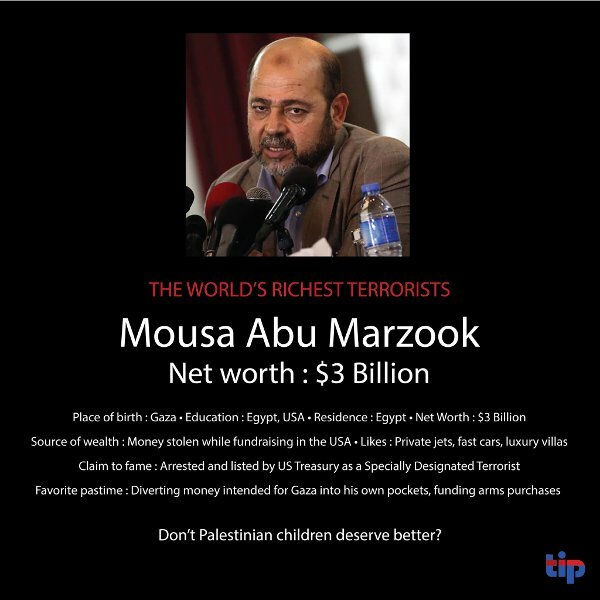 Legislators and government officials in many countries believe that it is unethical or illegal to fund the PA while it pays salaries to terrorists and uses its budget to incite hatred and terror. The 62-70% drop in funding to the PA this year may, in part, reflect governments acting in response to such opinions. Will all this work, or will the terror funding and corruption continue while the Palestinian people suffer? The PA chairman's two sons own an economic empire in the territories worth hundreds of millions of dollars. Abbas' main endeavor is to find a successor who will ensure both the continued existence of his sons' businesses and their wellbeing. Yousef's report describes the family's business empire, which is based on Abbas' own commercial ties and his connections with states and large companies worldwide, all of which benefit his two sons' business concerns. Abbas' two sons own a large business consortium called "Falcon" that has taken over the 'West Bank's commerce and its labor market. Abbas supports the group, and he has arranged many favorable conditions that give it advantages over other companies. The Falcon tobacco and cigars company. The Falcon electricity and mechanical contracting company (it has branches in the 'West Bank', Jordan, and the UAE). Abbas has mustered $890,000 in assistance for it. The Falcon international media company. The Falcon general investment company,Â whose profits total $60 million. The Al-Mashrek insurance company, which has 11 branches in the territories with a worth estimated at $35 million. The Al-Khayar al-Awal company for projects and development, headed by Yasser Abbas. TheÂ Al-Masri Al-YoumÂ report claims that the Abbas family has accumulated its wealth over many years and that Muhammad Rashid, who was Yasser Arafat's economic adviser, told him that Abbas had misappropriated a sum of at least $100 million. Yousef asserts that Tarek Abbas has smuggled antiquities from the territories abroad and has dealt in land and the selling of commercial concessions. 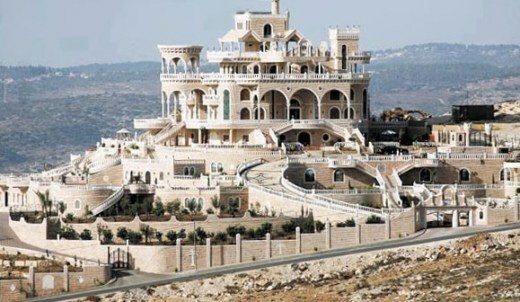 The Abbas family's corruption is a hot topic in the territories, but not here in the U.S.Â Tareq Abbas,Â son of the Palestinian Authority president, is aÂ multi-millionaireÂ owning villas in Amman, a Beirut rooftop pad and a luxury London flat.Â His older brother, Yasser, has made a fortune from, among other things, his monopoly sale of U.S.-made cigarettes in the Judea and Samaria a.k.a. the West Bank. Leaked records from a Panamanian law firm show that PA President Mahmoud Abbas and his two sons used power and influence to control the two major Palestinian economic boards (Arab Palestinian Investment Company, Palestinian Investment Fund) and built a West Bank economic empire worth more than $300 million. Abbas' authoritarian rule has allowed his family's Falcon consortium to dominate the West Bank's commerce and labor markets including owning shopping centers, media and insurance companies and distributing food, cigarettes, cosmetics and other consumer items.Â Falcon touches every aspect of Palestinian commercial life. These documents, reports from senior Fatah officials and Palestinian social media reveal extensive corruption at the highest levels - the Abbas family and a Palestinian elite manipulating the political and financial systems to benefit themselves at the expense of the people. The 1993 Oslo Accords established Palestinian self-rule over 98 percent of the Palestinian population in the West Bank and Gaza. Since then, the PA received an estimated $25 billion in financial aid from the U.S. and other Western countries,Â the highest per capita assistance in the world. Instead of creating the independent and robust civil institutions necessary for good governance, promoting peace with Israel and improving the lives of its people, the billions of dollars of international aid were used to create a corrupt dictatorship focusing on enriching its elites, inciting its people against Israel, advocating terrorism and waging a massive international campaign to demonize, delegitimize and destroy the Jewish State. And the U.S. doesn't seem to care, donating $442 million of taxpayer money in 2016. Abbas is currently in the eleventh year of a four-year term. He rules by decree, and parliamentary and presidential elections are not on the horizon. A May 2016 independent poll showed that 95.5 percent of Palestinians believe Abbas government is corrupt. Public perceptions of widespread corruption areÂ reinforced by the lavish lifestyles enjoyed by top PA officials, as well as the lack of transparency and accountability of the Palestinian government. The Palestinian legislature, which previously had provided some measure of oversight, hasn't convened since 2007, leaving Abbas free to rule by diktat and award family and cronies with exorbitant salaries and opulent villas in subsidized gated communities on the outskirts of Ramallah. Hasan Khreishah, Palestinian Legislative Council member,Â remarked, "Sinceâ€¦the Oslo Accords we have had 228 ministersâ€¦.All receive high salaries and luxurious vehicles." Â The head of the Palestinian Investment Fund makes $420,000 per year while the average worker makes about $4,600 annually. The PA fails to submit budgets for required audit, eliminating oversight of how over $4 billion is spent each year. As part of its "development budget" of $17.9 million for the first quarter of 2014, funds specifically designated for projects to benefit the Palestinian community, $9.4 million was budgeted for Abbas' presidential plane and another $4.4 million was budgeted for "other" expenses. Abbas recently established a new "constitutional" court to oversee lower courts and packed it with his Fatah political party accomplices to intentionally enhance his control of powerÂ and purse-strings. The PA refuses to use its considerable international aid to relocate over 100,000 Palestinians from Palestinian-controlled refugee camps to residential locations in the territories, preferring to leave them confined under squalid conditions. Muhammad Rashid, former Palestinian leader Yasser Arafat's economic advisor, claims that Abbas misappropriated at least $100 million from Palestinian coffers. Abbas' political rival Muhammad Dahlan accuses Abbas of stealing $600 million of the $1.4 billion that Arafat's Prime Minister Salam Fayyad transferred to Abbas when Abbas assumed the Palestinian presidency. An EU audit of the years 2008-2012 found that 2 billion Euros of its aid were lost to corruption and misappropriation by Palestinian leaders. Today, nothing has changed. The West is fixated on creating a Palestinian state no matter how corrupt. Given Abbas' perfidious dictatorship, such a state is doomed to failure. All indications are that President Obama will reward this reprehensible behavior with a rapid path to statehood. Why is the Abbas kleptocracy illegitimate in the eyes of the Palestinian people, but acceptable in the eyes of Obama and the West? Ziva Dahl is a senior fellow with the Haym Salomon Center. She has a Master of Arts degree in public law and government from Columbia University and an A.B. in political science from Vassar College.